What do you draw to loosen up? What is "Poetic" in Art? Did Nuns Paint Medieval Illuminations? Did you make a New Year's Resolution? 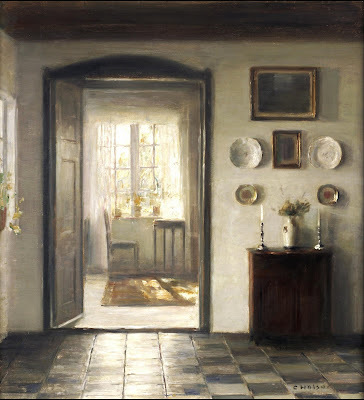 Carl Holsøe (Danish 1863 - 1935) captured a remarkable feeling of light in this interior. What strikes me is that he did so with a very limited range of colors. There appears to be very little blue. Essentially it's just black, white, and brown. The enlarged image below shows how impressionistic the painting is in its close-up detail. The light dissolves the forms in the window, on the table. And the light overwhelms the local colors on the rug and on the floor tiles. The base of the chair and the little table are soft and downplayed, and the darks are not too dark in the far room. Holsøe was a friend of Vilhelm Hammershøi, who did similar subdued interiors. That is beautiful! But I love sunrooms. And so interesting... limited pallet, darks to lights, detail and not. I'll have to give it a try ~ thanks for sharing! Love this Post ! amazing.